While DNA can reveal much about the appearance of a subject, information about features such as age, body mass index (BMI) or the presence of facial hair are not available within an individual’s genetic code. Snapshot forensic art services provide a means of incorporating such information into a Snapshot composite when it is available from non-DNA sources. 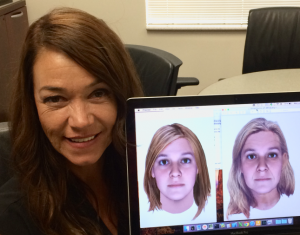 Examples of age progression and accessorization with Snapshot Forensic Art Services. By default, Snapshot produces composites from DNA at 25 years of age (A). Composite (A) shown after age progression to age 50 years (B); with the addition of a light beard (C); after further age progression to age 75 years with reading glasses (D); and with a full beard (E). Our Forensic Art Department — under the direction of Thom Shaw, who is certified by the International Association for Identification (IAI) in the discipline of forensic art — offers age progression, BMI alteration, and accessorisation services, which may include the addition of facial hair, eyeglasses, piercings, etc. We can also create composite sketches from eyewitness accounts and combine them with traditional Snapshot composites; in this way, corroborating the witness account or adding objective phenotype information to help produce the most accurate composite possible. 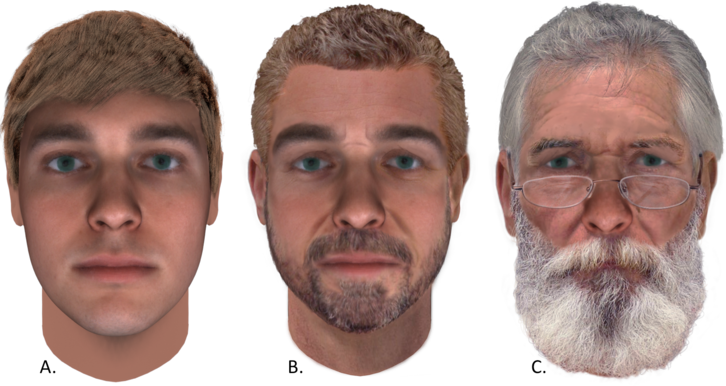 Composite (A) shown after age progression to 50 years old, including a beard (B) as compared to the actual subject (C). shown at age 25 and age progressed to 49 years old. Forensic artists are artists with special training to address forensic challenges. They have an expert understanding of the human face and how the effects of aging and body mass index (BMI) change appearance. Those trained in facial reconstruction learn how to infer the most likely distribution of muscle and soft tissue from a skull. Forensic artists who create composite sketches from eyewitness accounts are trained to conduct cognitive interviews, so as to get the most accurate portrayal from a witness’ memory. Our forensic artists are trained to conduct cognitive interviews and produce composites solely from an eyewitness account. The interview and composite production is conducted online with screen sharing technology, so eyewitnesses do not have to travel. When DNA is available for the same person of interest as seen by the eyewitness, Snapshot can provide a corresponding composite from “the genetic witness” perspective. Our artists can combine a composite from an eyewitness account with one produced by Snapshot to produce a single, highly accurate rendering that contains the best that both sources of information can offer. In some instances, descriptive information about a subject’s accessories or distinguishing features is available that can be used to enhance a Snapshot composite. For example, a surveillance camera image may be too grainy for identification, but nevertheless suggestive that a suspect has facial hair. Similarly, an eyewitness may recall a tattoo or scar, even though they were too traumatized to remember much else. In such cases, our forensic artists can accessorize a Snapshot composite to include all available descriptive information about a subject. When unidentified human remains include a skull, our forensic artists can perform facial reconstruction, literally building up the corresponding face using knowledge of facial musculature and soft tissues. Although facial features cannot be perfectly inferred from a skull, bone structure can be immensely informative about the shape of an individual’s face. 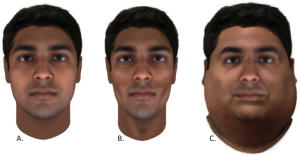 Snapshot predicts exterior face morphology, but when a skull is available, a forensic artist can use it to confirm or enhance a Snapshot composite based on facial reconstruction. 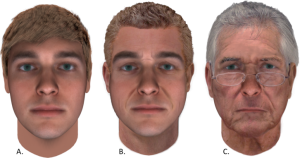 Examples of age progression with Snapshot Forensic Art Services: the predicted composite at 25 years old (A); shown after age progression to age 50 years (B); and after further age progression to 75 years of age. 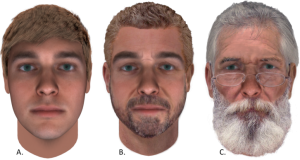 Examples of accessorisation with Snapshot Forensic Art Services: the predicted composite at 25 years old (A); shown after age progression to age 50 years, with the addition of a light beard (B); and after further age progression to age 75 years with reading glasses and a full beard (C). 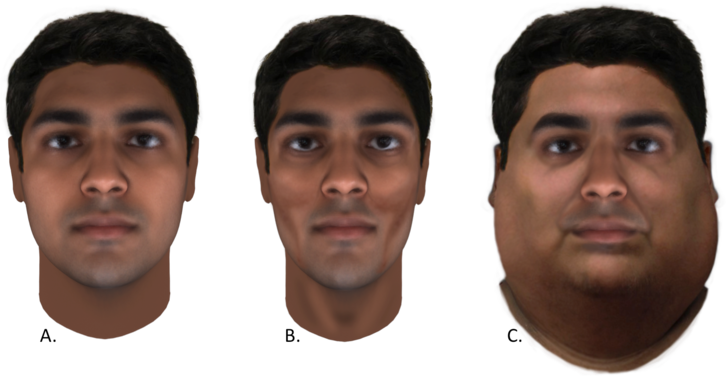 Extreme examples of body mass index (BMI) alteration: the original prediction (A); shown with significantly less body mass (B); and again with a significantly larger amount of body mass (C).